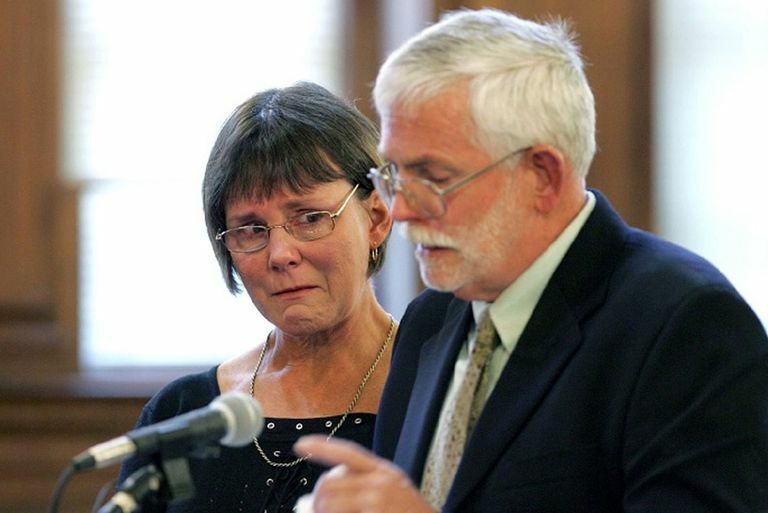 John and Nancy Hoban Read Their Victim Impact Statement on the Second Day of a Three-Day Sentence Hearing for Daniel M. Biechele at Rhode Island Superior Court May 9, 2006, in Providence, Rhode Island. One of the most effective tools victims have in the fight against crime is the victim impact statement used at the time of sentencing of defendants, and in many states, at parole hearings. All 50 states now allow some form of victim impact information at sentencing. Most states allow either oral or written statements, or both, from the victim at the sentencing hearing, and require victim impact information to be included in the pre-sentence report, given to the judge before imposing sentence. In a majority of states, victim impact statements are also allowed at parole hearings, while in other states a copy of the original statement is attached to the offender's file to be reviewed by the parole board. Some states allow these statements to be updated by the victims, to include any additional impact the original crime has had on their lives. In a few states, victim impact statements are even allowed a bail hearing, pretrial release hearings, and even plea bargain hearings. For most victims of crime, these statements provide them an opportunity to focus the court's attention on the human cost of the crime and allow the victims to become a part of the criminal justice process. More than 80 percent of crime victims who have given such statements consider them to be a very important part of the process, according to a survey by the National Center for Victims of Crime. In some states, but not all, the law allowing victim impact statements specifically require the judge (or parole board) to consider the statements in making a decision. In those states, the victim statements indeed have more impact on the judicial process and outcome. The physical, financial, psychological or emotional impact of the crime. The harm that was done to family relationships by the crime, such as the loss of a parent or caregiver. Descriptions of medical treatment or psychological services required by the victim as a result of the crime. The victim's opinion of an appropriate sentence for the offender. Most states have a Victim Impact Statement form available for victims to complete. If the state does not have a form, focusing on the questions above is helpful. Also, all states have victim assistance programs. If you have questions about completing the statement, you can always contact the victim assistance program and ask for help or clarification. Many people will be reading your statement including the judge, attorneys, probation and parole officers, and prison treatment personnel. The answers should be written neatly or typed. Completing the answers on a separate piece of paper will allow for errors to be fixed before transposing the information on to the final form. Ask for additional forms in case you make a mistake or decide to re-word your answers. When completing a form, it is not mandatory that the answers fit into the space provided. Include additional sheets when necessary. Try to keep the answers concise, but do write descriptively. You want to express the depth of how you feel (fear, trauma, and severe loss) and by using descriptive words, it will people identify with your experience. Discuss how you felt while the crime was taking place or the emotional impact this crime has had on your life. Discuss the physical, psychological, and financial impact of the crime. Use specific examples of how the crime has changed your life. Document and itemize financial losses, as a result of the crime. Include both major and minor losses. For example, loss of work, the expense of moving, the cost of gas to go back and forth to doctor's offices as a result of an injury incurred during the crime. Also, include future expenses. Do not include information that identifies your physical address, phone number, place of employment, or email address. The defendant will have access to your letter or the statement you read in court and could use the information to contact you in the future. Do not introduce new evidence not covered at the trial or repeat evidence already presented. Do not use derogatory or obscene language. To do so will diminish the impact of your statement. Do not describe any harm that you hope the offender will experience in prison. If you do not feel that you can read your statement in court, or you become too emotional to finish it, ask for an alternate or family representative to read it for you. If you want to show a picture or some other object while giving your statement, ask the court's permission first. Write out your statement before speaking to the judge. Reading a statement can become very emotional, and it is easy to lose track of what you are saying. Having a written copy will help you cover all of the points that you want to convey. When you read your statement, focus on speaking only to the judge. If you want to speak directly to the defendant, ask the judge's permission to do so first. Remember, directing your comments to the accused is not necessary. Anything you want to convey can be done by speaking directly to the judge. Do not let the defendant manipulate you into losing your control. Many times criminals will purposely try to anger the victim during their statement so that they do not finish. They may snicker, laugh, make sarcastic faces, yawn loudly, or even make obscene gestures. Some criminals will even shout out derogatory comments about the victim. By staying focused on the judge, the criminal will not be able to sabotage your statement. Do not express anger about the trial, the attorneys, the court or the offender. This is your time to express the pain you have experienced and influence the sentence the defendant will receive. Anger, explosive outbursts, using obscene language or making reference to what kind of harm you hope the defendant will face in prison will diminish the impact of your statement. Laws regarding victim impact statements vary from state to state. To find out the law in your state, contact the local prosecutor's office, the state Attorney General's office, or a local law library.